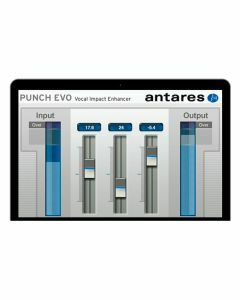 PUNCH EVO is a unique dynamics processor that, as its name implies, is designed to give your vocal more dynamic impact, allowing it to cut through a dense mix with clarity and power. It provides a combination of compression, gain, limiting, and overload protection with a user interface designed for speed and simplicity. Gain -Â This control allows you to increase the gain of your vocal. Impact - This is where the magic happens. This control lets you select the amount of â€œpunchâ€ that is added to the vocal. As you increase the value of this control, level variations in the vocal performance are equalized and their level raised. Ceiling -Â This control allows you to attenuate the signal after all other processing. Although PUNCH EVO allows you to create a full- level signal without risk of ugly distortion, it will usually be wise to apply at least a little attenuation here to allow yourself some room for any further processing that might apply gain. â€¢ Pro Tools 7.x to 10.x. â€¢ Windows 7 to 10. as required by your version of Pro Tools. â€¢ Windows 7 to 10 as required by your host. â€¢ Pro Tools 7.x â€“ 10.x.